If you would like to learn more about installing a metal roof on a new building or replacing your current roof with a metal roofing system, contact Greeley’s expert roofers at Sorensen Roofing & Exteriors, G.C. today! We provide free estimates for all of our Colorado and Wyoming roofing services. If you need metal roof repairs or want a metal roof installed on your Colorado home or commercial building, make sure to go with a roofing contractor with experience in this type of roofing material. A reputable contractor should provide you with a free estimate for roofing work, as well as references based on past metal roofing installations. The cost of installing a metal roof will depend on the size, slope, and style of your roof. Steeper roofs always cost more because of the extra staging that’s required. A complex roof with many valleys and intersecting ridges will be more expensive than a simple gable or shed-roof structure. We utilize Eagleview technology to map your roof and provide the proper material amounts each time. Contact us today, to find out which roofing materials are right for your home! Sorensen Roofing & Exteriors are the professionals to turn to in metal roofing, as well as other types of roofing systems. We have the equipment and expertise to handle all of your roofing needs, including roof repair, roof replacement, and new roof installation in Greeley, Arvada, Littleton, Denver, Colorado Springs, Aurora, Longmont, Englewood, Broomfield, Fort Collins, Boulder, and nearby. Contact us today to schedule an estimate for metal roofing. Give us a call at (970) 251-0911 or contact us online to meet with one of our experts as soon as possible! An asphalt shingle roof can wear out in 15-20 years when exposed to severe weather, like intense sunlight or heavy snowfall that causes ice dams to form along roof eaves. In contrast, metal roofing stands up exceptionally well to weather extremes. It’s a safe bet that a newly installed metal roof will last 40–60 years. The installed cost of a metal roof is subject to the same variables that determine any roofing installation: roof size, roof pitch (steep roofs cost more), and roof complexity (the number of valleys, ridges, skylights, and dormers). That said, you can expect a metal roof to cost two or three times as much as an asphalt shingle roof. A metal roof typically costs about the same as a tile or cedar shingle roof, but less than a slate roof. Thanks to the super-durable, factory-applied finishes used on metal roofing, today’s metal roofs are exceptionally durable and resistant to weather-related damage. Unlike asphalt and wood shingle roofing that holds snow, a metal roof will shed snow, which prevents damaging ice dams from forming. Metal roofing won’t degrade in direct sunlight like a wood shingle roof can. Nor will it lose a protective layer of material, which is what happens as asphalt shingle roofing slowly sheds its protective granules. A properly installed metal roof exceeds building code requirements for resistance to uplift in high winds. Although hail damage (denting) can occur in a severe hail storm, dented panels can usually be replaced easily. About 20 billion pounds of asphalt shingles are dumped into landfills in the U.S. every year. This isn’t good for the environment. In contrast, a new metal roof can often be installed directly over an old asphalt shingle roof, and it will last 2-3 times longer. 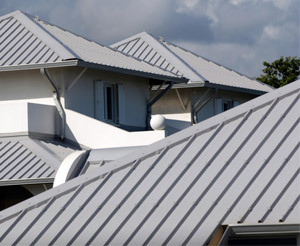 Metal roofing contains recycled steel, and it’s easier to recycle than asphalt shingles. The variety of metal roofing styles often surprises someone unfamiliar with this roofing material. Although you can install metal roofing manufactured to look like other materials (slate, wood shingles, tile), many home and business owners opt for metal roofing panels manufactured in different parallel profiles that run the length of each panel. As for metal roofing colors, your choices are almost unlimited. Compatible flashing, transition profiles and other roofing elements are also available to give your metal roof a well-crafted appearance.